There are many things to see inside Mandalay Palace in Myanmar, as there are so many attractions to see around Myanmar. This Southeast Asian country, also popularly known as Burma, is home to thousands of temples, palaces and ancient ruins, and quite obviously the Mandalay Palace is one of the most grandiose. Constructed from 1857 to 1859, the palace is the last royal palace of the last Burmese kingdom when Mandalay was the capital city of the monarchy. The many attractions that make this palace special include the Clock Tower, Relic Tower, Watch Tower, Hluttaw, Royal Mint, Glass Palace and so on. Found on the eastern entrance of the palace grounds is the Clock Tower, a simple structure but very iconic since it has been a silent witness to the passing of time. It announces the time by regularly sounding a gong and a huge drum every third hour. The tower consists of a high square plinth with four columns on top, a wooden platform, double roof and an “hti” or umbrella. The tower makes use of a water-clock, which is a pinched water jar that lets out a calculated amount of water into a brass bowl. A bowl takes almost exactly an hour to fill, thus signaling that an hour has passed. Nearby is the Relic Tower, also known as the Tooth Relic Tower. What’s amazing about this tower is its architecture, not what’s inside. There is nothing inside. Constructed in 1903, it was customary in those days to build a relic tower although there was nothing enshrined in this one. 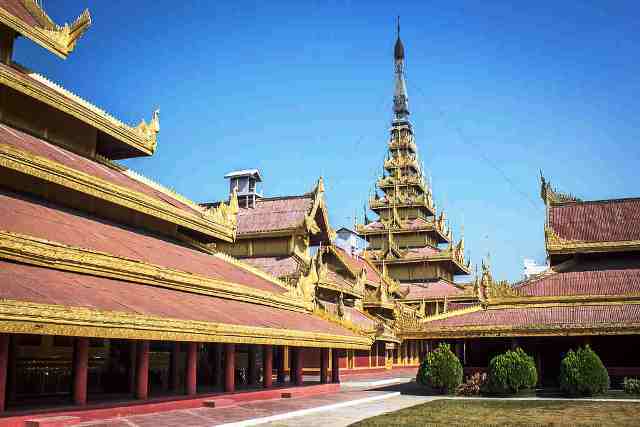 It is, however, a very good example of traditional Burmese architecture, having three parts: a low basement, rectangular block or terrace and a relic chamber with a three-layer roof. Like the Clock Tower, it is also capped by an hti. The basement and terrace have four ornamented sides and four corners with a small square pillar in each. Each corner has a marble statue of a winged leogryph, a monster with two bodies and a human head. Meanwhile, the walls of the main relic chamber are adorned with plaster carvings. The stairways leading to the chamber are also well ornamented, which is typical in almost all ancient Burmese structures. The Watch Tower is rightfully the tallest among the three towers. Standing at a height of 24 meters, it offers a panoramic view of the city, rivers and lakes; a view that was once often enjoyed by the past kings and queens. From the tower, the royalties observed from the Thadingyut Festival at the end of the Buddhist Lent. Folk stories also tell of the queen climbing the tower to witness from there the coming of the British troops as they conquered Mandalay in 1885. What stands today is the original tower, since it miraculously survived the bombings during World War II. In addition to the towers, the Hluttaw or Supreme Court is also quite an eye candy. It has a picturesque three-roofed hall that is richly decorated with flowers, figures and relics. There are massive red colored and gilded teak pillars, and inside is the royal Lion-Throne also referred to as Sihasana. Other important attractions within and around the Mandalay Palace are the royal mausoleums to the north of the Clock Tower, the Royal Mint near the mausoleums, the Palace Wall and its 48 bastions, Palace Gates, palace platform, moat, the Great Audience Hall and the amazing Glass Palace, which is the largest structure inside the palace.